In a historic speech this past August commemorating the 70th anniversary of Japan’s surrender in World War II, Prime Minister Shinzo Abe vowed that his country would “never again resort to any form of threat or use of force as a means of settling international disputes.” A month later, his administration passed a bill that could now put Japan’s armed forces on the fighting grounds of distant lands—including Iraq and Syria. For the first time since World War II, the Japanese parliament abandoned its longstanding pacifism in favor of a new security bill that authorizes offensive military operations overseas under the premise of “collective self-defense.” Although more than half the population opposes the measure, Abe has continued to push for changes in security policy, invoking the threat of Japan’s regional enemies and the need to offer military assistance to its number-one ally, the United States. The new legislation—passed by the upper house in September—allows him to “reinterpret” Japan’s pacifist constitution without going through an amendment process and neuter, in effect, its key provision, which outlaws the deployment of military forces abroad. PM Shinzo Abe’s militarism seeks to recast Japan as an “equal partner” with the United States. Article 9, dubbed the “peace clause,” is part of the constitution that was adopted during the US occupation of Japan in the wake of the war. The American drafters, as though conducting a social experiment, engineered a constitution that emulates and even surpasses the ideals of popular sovereignty and individual rights enshrined in the United States Constitution. Abe’s defiance of the 68-year-old document stems in part from his desire to rid the country of its past under occupation, starting with dismantling the constitution that he says was “drawn up under significant compulsion.” As a top US ally, Japan has also faced pressure from the United States to become a “normal nation” with full military capabilities. Abe’s militarism seeks to recast Japan as an “equal partner” with the United States in the international arena. In Japan, civic demonstrations of this scale have been dormant since the days of the 1960s student uprisings, when more than 300,000 students, fearing they would be dragged into the US-led war in Vietnam, stormed the legislature to oppose the expansion of Japan’s bilateral security treaty with the United States—a plan advanced, ironically enough, by Abe’s grandfather Nobusuke Kishi. More than half a century later, at least 100,000 people (as in the Vietnam War–era protests, organizers’ and newspapers’ estimates far exceeded official police figures) took to the streets to reject militarism once again, marking the revival of civil disobedience in a country that has grown far too accustomed to business-as-usual. Yet unlike the ideologically inflected protesters of the 1960s, the front-runners of today’s protests come from a sphere of society that has long been considered “apolitical” by the rigid political establishment of graying men—and the new anti-war movement is a demand of a different sort. The organizers of the mass protests, which began in early summer, were not the usual bevy of old-school leftists and trade unionists, but a group of tech-savvy university students who see Abe’s new security measure as a harbinger of authoritarian rule. The Students Emergency Action for Liberal Democracy, known as SEALDs, has amassed widespread support across the country—with more than 60,000 Twitter followers and 34,000 likes on Facebook, the group has organized protests in more than 60 cities nationwide. The group’s success has even compelled new sections of Japanese society to engage in grassroots activism—in the latest of antiwar demonstrations, a group of SEALDs-inspired high-school students organized a mass rally that saw as many as 1,000 protesters occupy the streets of Harajuku and Shibuya. The student group first began as an assembly of cosmopolitan youngsters opposed to Abe’s state secrecy law back in 2014—previously called Students Against Secret Protection Law (SASPL), the group led a series of protests against the Orwellian bill, which threatened prison time for journalists and whistleblowers who disclose “state-designated secrets.” While SASPL failed to stop the secrecy law from taking effect, the movement solidified the group’s role as a leading grassroots voice against Abe’s regime. In a public hearing before the Diet, 23-year-old founding member Aki Okuda, now a household name in Japan, criticized the government’s unwillingness to consult the people on the new security bill and even called out parliament members who dozed off as he was speaking. 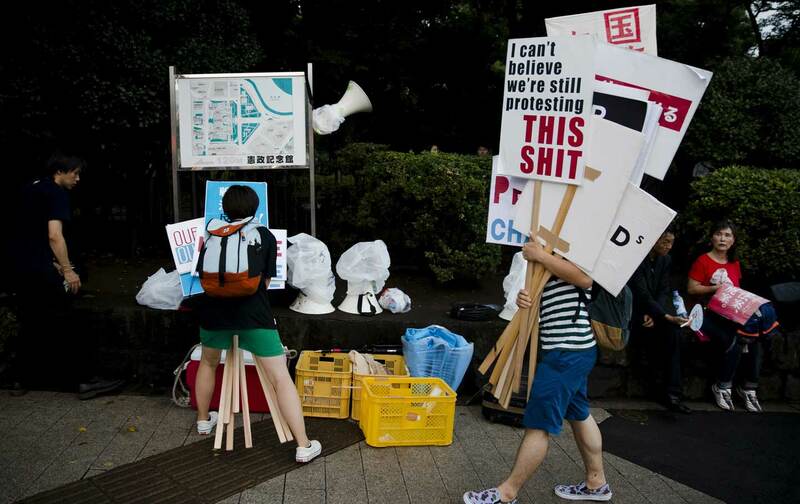 Alongside the new generation of student protesters, the emergence of another grassroots organization is garnering considerable attention in Japan. Starting in July, the group Mothers Against War has staged antiwar demonstrations all across the country—in one of the group’s largest rallies, over a thousand mothers, many of them carrying children, marched in Tokyo’s city center demanding that lawmakers scrap the controversial bill. Founded by Minako Saigo, a 28-year-old graduate student and a mother of three young children, the group has collected over 20,000 signatures from people against the legislation and recently held a press conference in which several members of opposition parties showed their support. Under the slogan “save all children from war,” the group embraces a global approach to the issue of Japan’s remilitarization. In a TV interview, Saigo warned that as an ally of the United States, Japan’s authorization of military force could endanger the lives of children in Gaza and Syria, as well as other parts of the world where the US military is involved. The group has also voiced concerns over the Trans-Pacific Partnership (TPP) and support for protesters in Okinawa, who have been fighting against the construction of a US military base in Nago. Mothers Against War began as a Facebook group where women, busy caring for their children, could easily share information and discuss the security bill with other concerned mothers. As the group quickly gained support online, the page soon became a platform for organizing—from informational picnics to costumed protests on Halloween, mothers used Facebook to band together, forming a new coalition of parents, some of whom previously had little or no interest in politics. Since July, regional chapters of Mothers Against War have popped up in at least thirteen prefectures around the country, with mothers organizing locally in their communities. While it’s easy to conflate the two, SEALDs and Mothers Against War each take a distinctive approach to Japan’s creeping militarization. For one, SEALDs defines its fight against the new security bill as a freedom issue—from its conception as a group calling for press freedom in the wake of Abe’s secrecy law, the group’s main focus has always been to protect the rights of people from an increasingly oppressive government. Mothers Against War, on the other hand, operates on the sole premise of a mother’s responsibility to protect her child, taking a more humanitarian approach. Their unwillingness to cave in to party politics stands in sharp contrast to the “new left” student organizations that led the charge half a century ago. Zengakuren—the umbrella student organization largely responsible for orchestrating the mass protests of the 1960s—was led by radical Marxists, many of whom broke away from the “old left,” including the Japanese Communist Party (JCP), for being too moderate. Unlike its 1960s counterpart, SEALDs avoids party lines or affiliation. “We are ordinary students,” said Suwahara. “We are simply members of the community who are sick and tired of politics as they stand.” In the background of their efforts to remain outside the established political stratum hovers the failure of the 1960s, when the student movement ended with Zengakuren devolving into warring factions just as the idea of revolution was becoming less and less attractive amid the allure of a newfound consumerism. Some observers on the left have criticized SEALDs and Mothers Against War for their refusal to join forces with existing political players and their lack of concrete alternatives. They claim that these groups, without a viable political platform, cannot make meaningful policy changes in the long run. And that may be true. But to dismiss the movement for its unwillingness to align with the left is to miss the whole point of the growing antiwar movement. The fight for democracy will not be an easy one. Following the Paris attacks in November, Abe has bolstered his rhetoric on expanding Japan’s foreign military presence. On December 4, his administration announced that Japan will launch an anti-terrorism intelligence unit, sending officials to areas with “high terrorist activity” in Southeast Asia, the Middle East, and northwestern Africa. Mounting fear over terrorist attacks has also shifted public opinion on Abe’s militarism—his approval ratings went up 3.5 points, to 48.3 percent, with close to 80 percent of respondents expressing concerns over terrorist attacks happening in Japan. In response to the West’s escalation of airstrikes against Daesh, SEALDs posted on its Facebook page (in English): “We are confident that this kind of military intervention is not an ideal way to solve the problem. No more vicious cycle of interventionism and terrorism.” As Japan faces increasing pressure to join the West’s fight against Daesh, the strength of today’s antiwar movement will undoubtedly be put to the test.